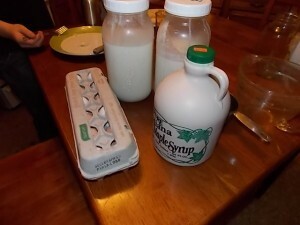 Even in winter, my family can consume ice cream by the gallon. The store bought ice cream has really cool reusable buckets, but the ingredients in there are not what I want to feed them, especially on a regular basis. My wonderful hubby helped me solve the problem, and we went ahead and purchased the ice cream maker attachment for my Kitchen Aid mixer. First, I mixed the cream and milk together. You don’t have to really use cream and milk, you can just use milk if you want, making it 5 cups. The cream does add an extra bit of creamy texture to it, though. Also, you really don’t have to use raw milk, you CAN use store bought milk, and I promise I won’t look 😉 Then, I stirred up the egg yolks. 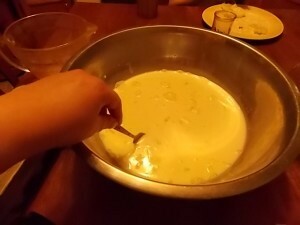 Added vanilla and salt to the yolks and then mixed into the milk/cream mixture. Poured into the ice cream freezer. 20 minutes later and viola! 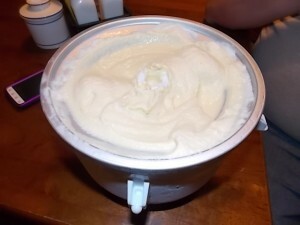 Homemade ice cream! 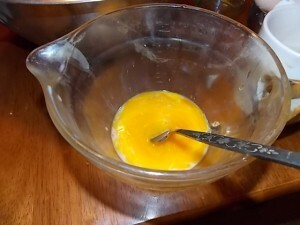 Now, I should really tell you that the original recipe calls for simmering the cream, milk and eggs together, then chilling for several hours. If you choose to use store bought eggs, you might want to consider that route. Since I am not afraid of raw eggs from my chickens (I know how and what they are fed) then I don’t worry about that step. All the ingredients are already well chilled, so I just pour it in. The original recipe also calls for “ripening” the ice cream in the freezer for a few hours, but I am not able to get my family to understand that, so they eat it soft serve style. It’s still really good, just a bit runnier. I read your post about homemade soap, and I was going to write it down. Now I can’t find it. Would it be possible for you to post it again? Thanks! 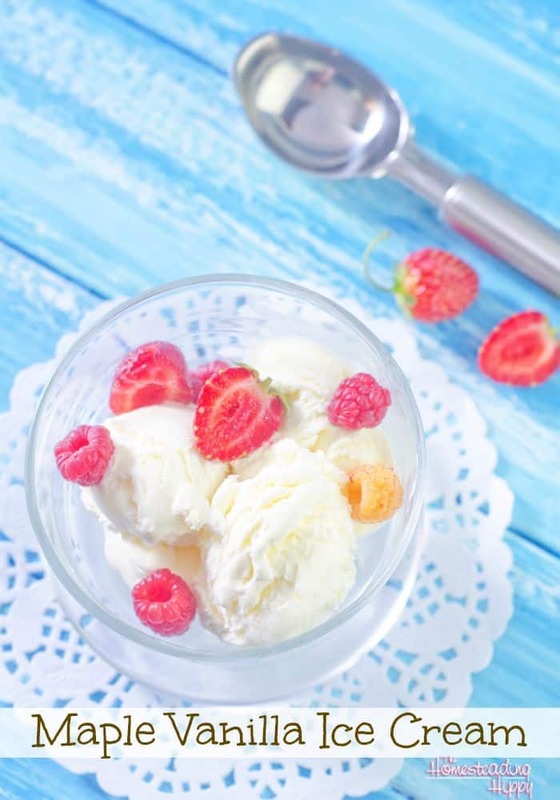 I just made your ice cream recipe, and I have to say it’s amazing!!!! I do not have an ice cream freezer. Will it be ok in any bowl do you think? sure! It may just not have the same texture…but the flavor will still be the same! When do you add the maple syrup? How long would I let this mix in a large ice cream mixer/freezer? Still 20 minutes? I think you would need to check the times on that particular machine. Freezing it directly may take a lot longer. Would this work in a blender if you didn’t have an ice cream freezer? Ok,so I was finally able to make this and after an hour in the ice cream freezer as directed, it is no thicker than a thin milk shake. What did I do wrong? Any suggestions? hmmmm….I don’t think you would have done anything wrong necessarily. I have that issue once in a while myself, and for me it’s random. I am not sure what happened. I am sorry! I think we figured out my ice cream freezer is just getting old and not turning the way it should. I put the ice cream mixture in my freezer and we ate it the next day! Tasted great! I will try again with a new ice cream freezer. Thx! I just found this recipe so I haven’t tried it yet. But when that happens to me, it is because my ice cream freezer bowl wasn’t cold enough either from not being in the freezer long enough or from the bowl being in a freezer that isn’t quite cold enough. This sounds so delicious! Thanks for sharing! Stopping by from the Gathering Spot Linky! I really need to get myself that ice cream maker attachment. I’ve been wanting one ever since I got my mixer 2 years ago. Thank you for sharing your recipe with us at Merry Monday! Pinned! I agree, Icecream is awesome at any time of the year. It is just too damn delicious….lol. Love this recipe. Awesome recipe! Thanks so much for sharing this with all of our Let’s Get Real readers. Ice cream is one of my guilty pleasures, but I really don’t have to feel too bad about it when the ingredients are as good as they are in your recipe. Can’t wait to give it a try. I didn’t realize that KitchenAid had an ice cream attachment. I need to check that out. You doesn’t love ice-cream! This recipe sounds delicious and filled raw health. Thanks for sharing on Real Food Fridays. Pinned & twitted. Could you add Fruit instead of the syrup? or does that help with texture or thickening? you should could! It would change the texture slightly, but I think to a GOOD texture as well…more like a frozen smoothie.